Are you ready for another day of My Creative Time sneak peeks? Today we have another darling set to share with you! It's called Healing Wishes, and it is has four of the prettiest flower arrangements (stamps plus dies), along with a bunch of sentiment stamps! For my card today, I did some "ink smooshing" with Tim Holtz Distress Ink in Mustard Seed and Abandoned Coral on watercolor paper, and added some splatters of Black Soot. I then drew a frame with a Sakura Black Glaze Gel Pen, leaving a space for a sentiment from Healing Wishes. The pretty flowerpot of tulips, also from Healing Wishes, was stamped on Strathmore Bristol cardstock, and I watercolored it with my Zig Clean Color Real Brush Pens. Just wait until you see the three other flower arrangements. They are all adorable! OH Miss Katey What a Beautiful card. The colors are so pretty and all of your Creative artistic talents sure showcase that pretty Tulip plant You sure did an incredible coloring job!! YOU ROCK!! So pretty, I love the splash of bright and cheery colors! Cute card! Love the tulips and splash of colors!! This card just pops. Thanks for the share. What a beautiful card! Love the bright colors you chose and the "smooshing" I am going to have to look into that. Your simple frame around it is a fabulous touch as well! Love it! Love the pretty tulips and your great background. Love the smoothed inks and how you did the frame. That pot of tulips is so cute! Wow, that is so beautiful! Love this new set. Your smooshing turned out pretty! I like how you did a simple drawn frame and left space for the sentiment. Reminds me of a good old MCT set from way back! I also like the flowers in this new set! Beautiful job on your card. Pretty card! Love that pot of tulips! So perfect for a spring card! 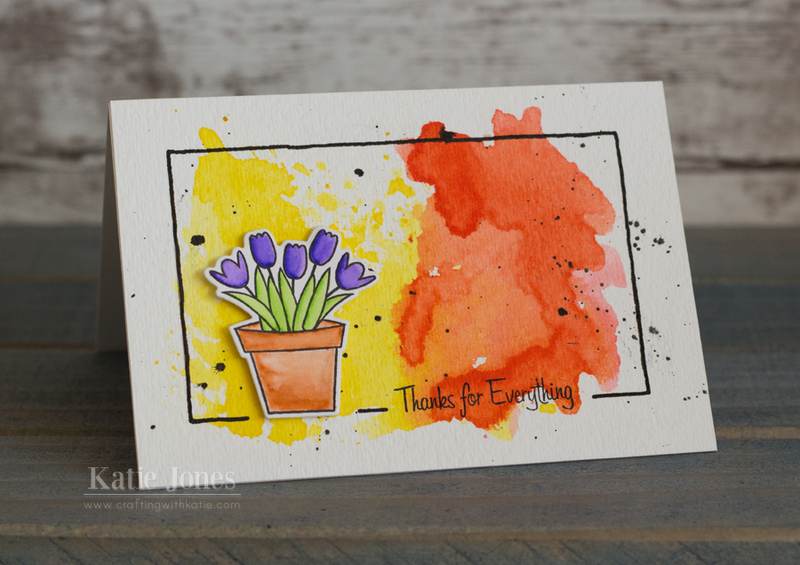 Love your watercolor card! That simple line around the card with a break for the sentiment is brilliant!!!! What a stunning g card- the black splotches are perfect to stress the watercolring. Great card. Simple yet so pretty. I really like this new set. Definitely a must have. Thank you for the inspiration.